Altair’s deaerators utilize a parallel downflow design for increased efficiency and flexibility that has over 70 years of time proven installations. 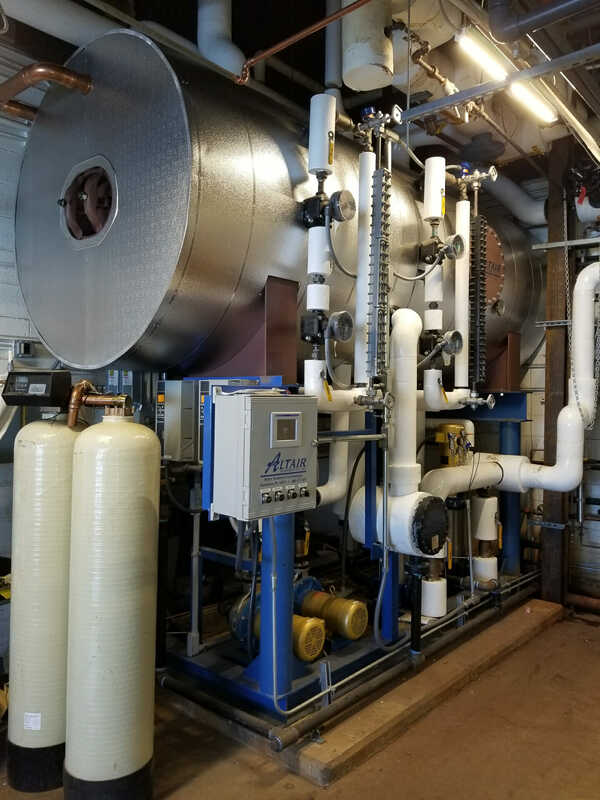 Altair’s is the only deaerator that is designed to handle installations with wide load swings, and 100% cold make up requirements, while producing 7ppb effluent. Our Parallel Down Flow Deaerators utilize heavy duty spray nozzles, stamped trays, and tray hold down assemblies to insure years of trouble free operation. Altair’s trays are one piece stamped 430 Stainless Steel. No riveting or welding to fail. Our spray nozzles are made from 304 Stainless Steel and Teflon for long life. Altair’s Parallel Down Flow Deaerators offer high efficiency through the use of trays with narrow offset slot openings, providing a large amount of spilling edge and allowing for maximum effective contact between steam and water. The design also eliminates damming up of water in the trays due to sudden increases in steam volume as occurs in counter flow designs during operating load swings, and operation with 100% cold make up. 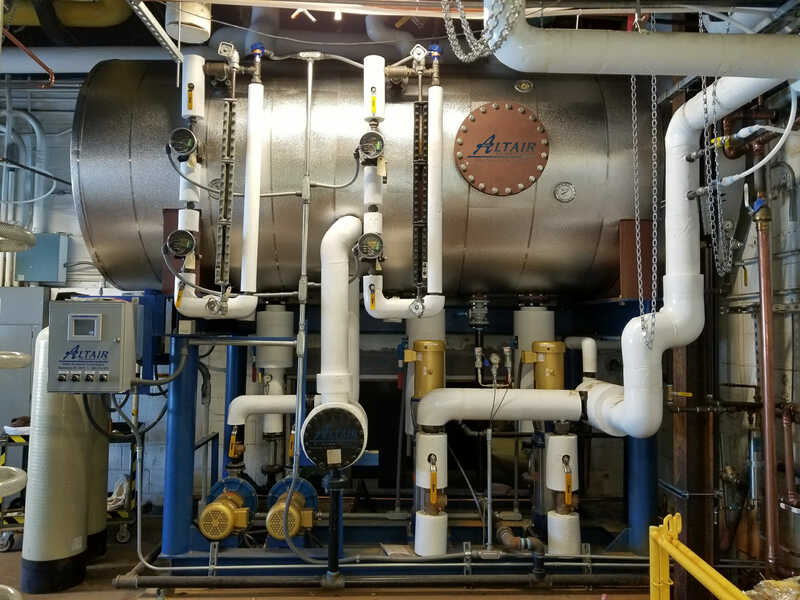 All Altair Deaerators are manufactured to the latest edition of the ASME Code, Section VIII, Division 1, for unfired pressure vessels, by certified ASME Code fabricators. Additional construction requirements are available if required. The deaerator shall be of the parallel down flow (co-flow) type, designed for oxygen removal of .005 cc/l (7ppb) and complete carbon dioxide removal, when operated at design conditions. The deaerator is to be designed to handle 100% cold make-up water, and varying plant loads from 10% to 100% of its design capacity. The deaerator is to be of vertical design, and flange mounted to a horizontal storage tank. 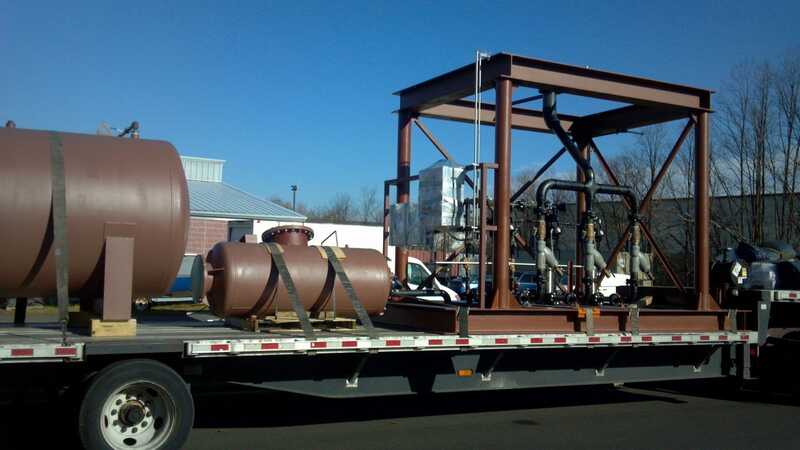 Both pressure vessels are to be manufactured and stamped in accordance with the ASME Code for unfired pressure vessels, Section VIII, Division 1. The deaerator and storage tank are to be shipped seperately. The internal direct contact vent condenser, consisting of spray nozzle(s) and vent piping, is to be manufactured out of 304 Stainless Steel. Water entering the deaerator will be sprayed into a steam atmosphere using a spring loaded spray nozzle(s), capable of providing a large exposed surface area of water to steam. The spray nozzle shall be manufactured from 304 Stainless Steel, and incorporate a solid teflon spreader, to eliminate metal to metal contact, and insure long operating life. Each deaerating tray is to be formed and stamped from a single piece of 430 Stainless Steel. The deaerator shall be designed so that the direct contact vent condenser and the internal design prevent noncondensible gases and undeaerated water from coming in contact with the pressure vessel shell. The deaerator is to have a minimum 14″ x 18″ manway opening for tray installation, and internal inspection. All necessary connections for instrumentation and level indication/control are to be included in the deaerator and storage tank design. The storage tank deaerated water outlet connection is to be equipped with a vortex breaker capable of preventing feed pump cavation. Most deaerators (Approx 70 to 85%) built over the past 50 years have not used any of the design requirements called out in the HEI stancards. With the exception of a very few deaerators (in paper plants) there have been little or no pressure envelope failures to warrant all the extra costs involved in the HEI standards. Deaerator specifications containing the blanket statement ” build to HEI standards” add costs to a piece of equipment that in most cases does not require it. If there are concerns about certain situations, it can be more cost effective to address (specify) only the actual concerns, i.e. 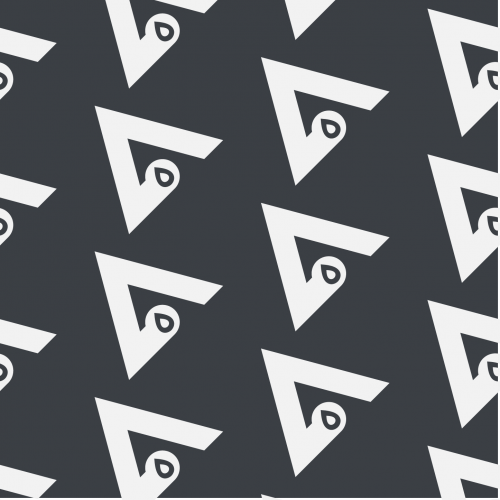 corrosion allowance, weld xray requirements, stress relief, etc. However, unless the deaerator is located in the harsh environment of a paper plant with the typical lack of inspection and maintenance, and high pressure operation, the HEI standards may be “gold plateing” that is not required by the actual application. Most plants with a deaerator operating at 5 – 10 psig, that perform a yearly plant shutdown for maintenance, will not require all of the extra design requirements invoked by the HEI standards. The HEI standard was developed by a joint effort of manufactures of counterflow type deaerators, to not only regulate the design of deaerator pressure envelope, but to also regulate internal construction and material requirements, by applying requirements of counterflow design to parrallel design type deaerators. The HEI specification states it is only for “tray” deaerators, not “spray” (atomizer) deaerators. If the contents of this specification are so critical to deaerator saftey and performance, then one must ask why is this specification not written to cover “all” deaerators. Is not any vessel using steam to remove non-condensable gases subject to the same failures that the specification is trying to eliminate? HEI specifications ADDS COST to deaerator construction, that MAY NOT be required in the majority of installations.